September 2nd marks the birthday of George Garvin Brown, one of the founders of Brown Forman. 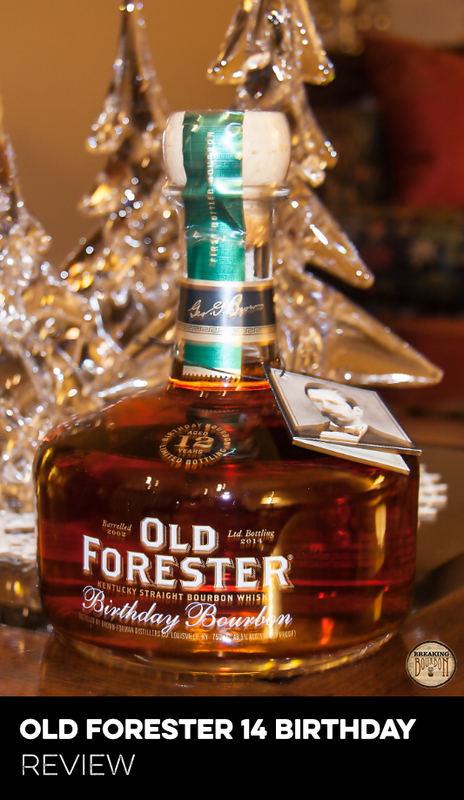 To honor him, Brown Forman released an Old Forester Birthday Bourbon. This bourbon is a special annual release that started in September 2002 and varies year to year based on age, warehouse location, number of barrels used, and so on. The bourbon comes in a special old fashioned glass bottle and is an anticipated release every year in the bourbon community. 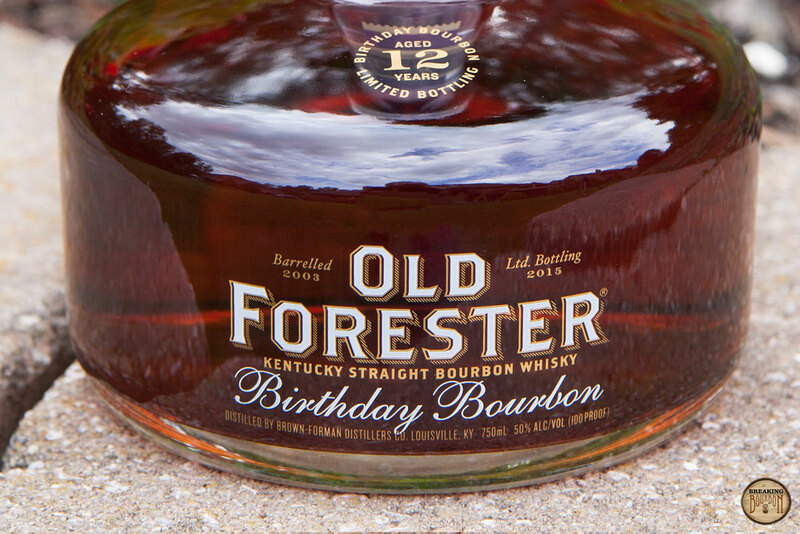 The 2014 bottling of Old Forester Birthday Bourbon marks the 14th year that Brown Forman has offered this bourbon. This is the first time Birthday Bourbon is being offered at 100 proof. 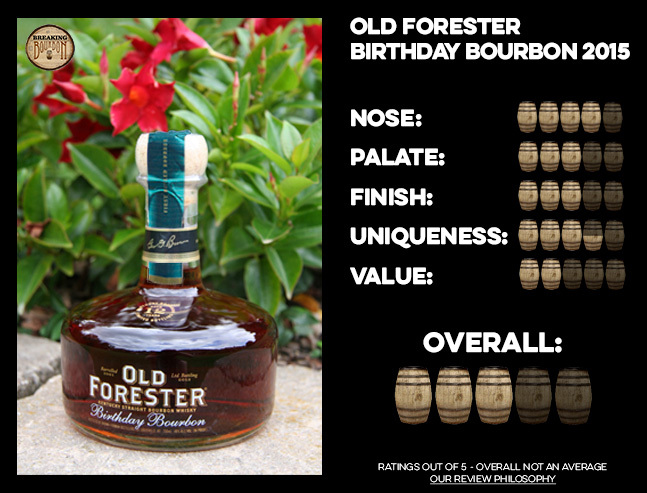 I’ve always found the Old Forester Birthday Bourbon series to have a great nose, and this year’s edition does not disappoint. “Rich” is the word that first comes to mind when I smell this bourbon. Dried tobacco leaves, mahogany, toasted oak, dried dark raisins and an underlying hint of chocolate are all noticeable. To me, this nose makes me think of fall. Rich in character and begging to be sipped outside on a deck while taking in the fall foliage. What jumps out at me immediately with this year’s version is how much drier it is than in years past. While a very light honey sweetness is noticeable, predominate flavors are dried wood, mixed-nuts, and subtle hints of dried orange all swirl together. Compared to the 2014 edition, the extra 3 proof points doesn’t add any additional heat to the palate. While the palate is tasty and the notes of sweet honey were more noticeable the longer I let it open up, compared to the palate on recent past years versions, I feel this years palate doesn’t stand up to them as much. Immediately noticeable is a peppery spice on the finish that seems to be isolated to my tongue only. This is followed by charred oak, leather, tobacco, and drier types of nuts such as a walnut for example. The nuttiness and heat linger and slowly dissipate over the next two minutes. It should be noted that the heat was isolated to my tongue only and never once moved down to my throat or stomach. This nutty finish is reminiscent of the 2009 edition with just a tad more spice upfront and a slightly fuller flavor profile. The 2015 edition is an interesting bourbon to ponder. From a Birthday Bourbon series standpoint, it’s the highest proof release to date, along with the only edition where the barrels all come from a single warehouse. However, with the proof increase comes the fact that this year’s Birthday Bourbon is the same proof as Old Forester Signature. It needs to be noted though that the flavor profiles are totally different and the extra years in the barrel set this far apart from Old Forester Signature. In terms of direct comparisons, this edition reminds me more of the 2009 edition more than any other recent past edition. Its woody, nutty flavor is a deviation of the sweetness usually found and the extra little spice on the finish was a nice addition. This series still tends to be the most consistently best tasting bourbon that Brown Forman produces each year in my book, and they should be given credit for this. It takes a lot to pull barrels from various warehouses (or a single warehouse in this year's case), with slightly different mashbills year after year and still release a really great product. Kudos to them on that point! The past few years has seen the Birthday Bourbon series go up a few dollars every year, and the 2015 edition is no exception. It actually bests all previous increases by being priced about $20 higher than the $60 asking price of the 2014 edition. While in the past it was easy to justify the price due to the great nose the series has along with a flavor profile to back it up, but $80 is pushing the limit. 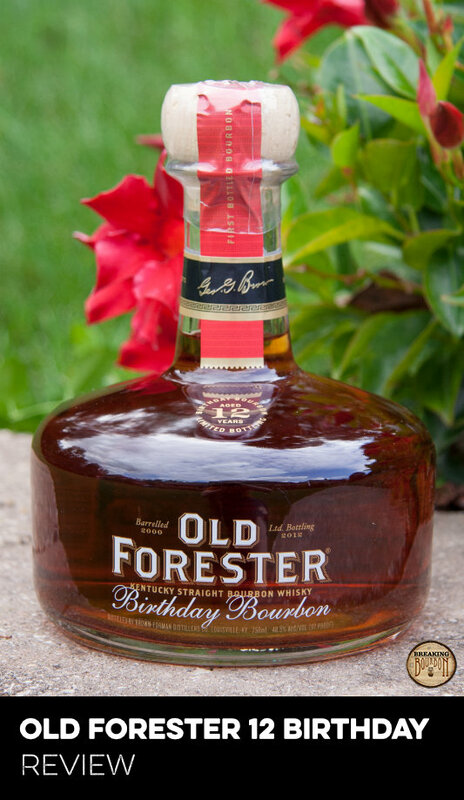 At $80 Old Forester Birthday Bourbon is now priced the same or higher then a number of other limited released bourbons such as Michter’s Toasted Barrel Finish, Elijah Craig Barrel Proof, and the entire Buffalo Trace Antique Collection, not to mention everyday favorites such as Blanton’s Single Barrel and Four Roses Single Barrel. Brown Forman realizes that there is a bourbon boom going on and that they can capitalize on it. And capitalize it they did. 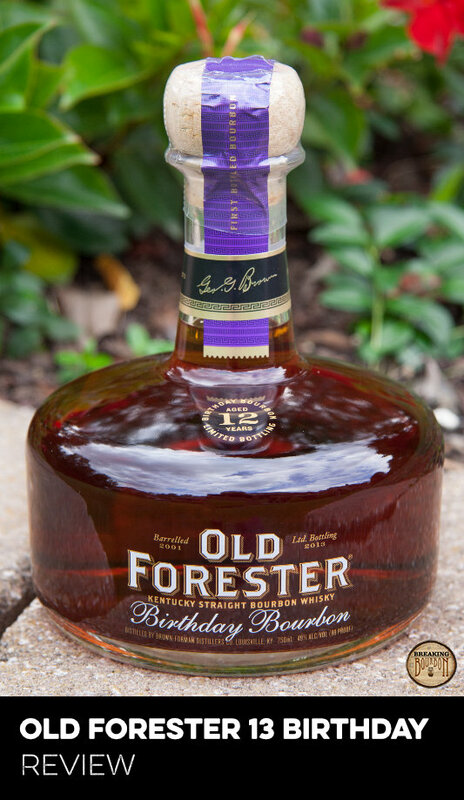 This year they specifically called out that there would only be 13,200 bottles for sale and even handed out t-shirts stating “I Went To Buy Old Forester Birthday Bourbon. And All I Got Was This Free T-Shirt” If that’s not feeding the whole bourbon hype, I don’t know what is. Is this a good bourbon? Yes it is. In fact it’s the best thing that Brown Forman releases. That being said, when you ask if this is this a good bourbon for $80, the answer becomes more of a mixed bag. Sure you’re getting one of the more consistent limited edition releases for the money, however at the same time you're paying $80 for only a 12 year old 100 proof bourbon. When you get into this price range I expect more out of the bourbon itself... not just a good bourbon that is limited production. Another solid Birthday Bourbon edition, although at a price point that is getting hard to justify for the series. Every year I look forward to the Birthday Bourbon series, and this year was no exception. With that being said, I’m truly disheartened to see the price increase as much as it did this year. Hopefully it holds firm at $80, because any higher price point would almost be a direct insult to the consumers who look forward to it every year. Additionally, when you get to the price point the Birthday Bourbon now plays in, consumers expect additional information on the bourbon they’re buying. It’s a shame that Brown Forman stopped providing specific mashbill and aging notes with their releases in 2013, as I’d love to see how closely this resembles the 2009 edition. Either way, it doesn’t seem like too much additional work to provide consumers with this information. Also, I’ve said it before and I’ll say it again, but my biggest gripe for this series is the bottle design. I realize that Brown-Forman is trying to play up the fact that it's a celebration bottle and brought it to retail in an "old fashioned" style bottle. However, it takes up a lot of shelf space and is a pain to pour from, often spilling down the sides. I’m sure the design won’t change anytime soon and I’m sure I won’t stop complaining about the design on future editions. All that being said, I still walked away from this year’s Birthday Bourbon with a smile on my face. The nose is once again fantastic and the other areas of the bourbon can back it up too. If you have the opportunity to buy a bottle, I highly recommend it. Even with the increased price, this bourbon is still worth exploring due to the solid flavor profile that it provides. The sample used for this review was provided at no cost courtesy of Brown Forman. We thank them for allowing us to review it with no strings attached.